What’s it like to be a new student at the Lilly Family School of Philanthropy? Topher Anderson is finding out now. The Marian University graduate began the in-person master’s degree program on Monday, beginning his journey studying philanthropy. Anderson will also serve as a McKinney Fellow during his time on campus. He came to philanthropy a roundabout way, though. “As a Christian, one of the important things you can do is care for others around you. So, I spent my first three years of undergraduate school at Marian planning and studying to become a doctor,” he said. With this mindset, Anderson moved forward to create a group focused on sustainability at Marian. “We wanted to figure out how to work on sustainability issues at Marian. I fell in love with it – the community organization, the lobbying with administration, making plans and implementing them, etc. The administration was so receptive and willing to work with us that it was so empowering to be involved,” he explained. When his senior year rolled around, Anderson realized that he did not want to become a doctor anymore. “I realized that for me, I felt like I could really make a difference in the nonprofit sector. From my experiences at Marian, I realized that I loved coming up with good solutions and then implementing them in partnership with others,” he said. 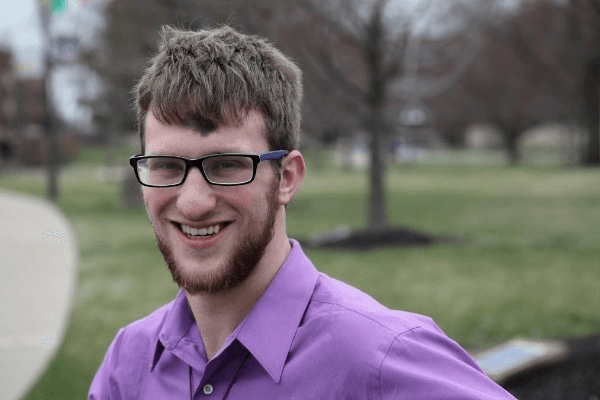 After graduating in 2017, he began a year’s term as a Governor’s Fellow, spending three months each in four different areas of state government. Anderson has also been volunteering with the Citizens’ Climate Lobby, a nationally-run but locally organized group that works on passing bipartisan environmental solutions through Congress. When he first heard about the master’s degree program at the Lilly Family School of Philanthropy, and the McKinney Fellowship that focuses on environmental causes in particular, Anderson knew he had found the perfect program. He’s excited to return to school and learn more about philanthropic studies. With his science background, Anderson is also excited to be a bridge with lab and content experts and others. Anderson is just one of many new graduate students at the school. Check out our blog posts over the next few months as we highlight these unique individuals.